Cut Waste with Meal Delivery Kits? The sheer immensity of the loss is staggering. Some 60 million tons of produce, thrown out every year—just in the United States alone. Recent research has estimated this could constitute as much as half of all US food produce. And what about meat and dairy? According to the Food and Agriculture Organization of the United Nations, the equivalent of 574 billion eggs are thrown out each year in Europe alone, and globally, over 20% of the 263 million tons of meat produced across the world each year is lost or wasted. According to the United Nations, this is the equivalent of 75 million cows, a larger population than most UN member states. It’s almost enough to make you cry, especially when you consider how many malnourished people could benefit from this food. And it’s not just the food that’s being wasted—it’s also the energy, labor, and land that is being used for nought. It’s a global issue, one that’s worsening, and it requires a global effort. The company envisions Stop Food Waste Day as an international day of action and raising awareness to fight food waste. Part of this fight is through educating people about steps they can take to cut food waste. Make a list: Keep tabs of what you’re eating, what you need for the house, and only buy what you need. Learn the art of freezing: Don’t let “toss it” be your first impulse. Make a habit of freezing leftovers, and also fruits and vegetables. And here’s a trick: those old brown bananas? They’re still perfectly fine, and if you freeze them, you can pop them in to the blender as part of a smoothie. Revive and restore: Just because veggies are looking a little wilted doesn’t mean that they can’t work great in a cooked dish. And if you overcook your vegetables, you can always drop them in a soup stock, a sauce, you name it. Beyond the more specific tips, saving food waste can be part of a wider daily approach to food and groceries. Just because something doesn’t look good, doesn’t mean it’s not good. Like bananas—a little browning doesn’t mean it’s no good. The same with a bruised apple, or some lettuce that isn’t 100% crispy. You can still enjoy it, no problem. We’ve been conditioned to expect fruits and vegetables to look flawless and flashy like they do in the grocery store, and that’s a major reason that so much food is wasted, and that countless tons of produce don’t even leave the field, and are left to rot in the sun, suitable to feed livestock at most. Home meal delivery kits have helped millions of Americans explore new culinary sensations at home, and pick up some cooking tricks at the same time. One of the knocks against meal kits though, is the high amount of packaging and waste produced. 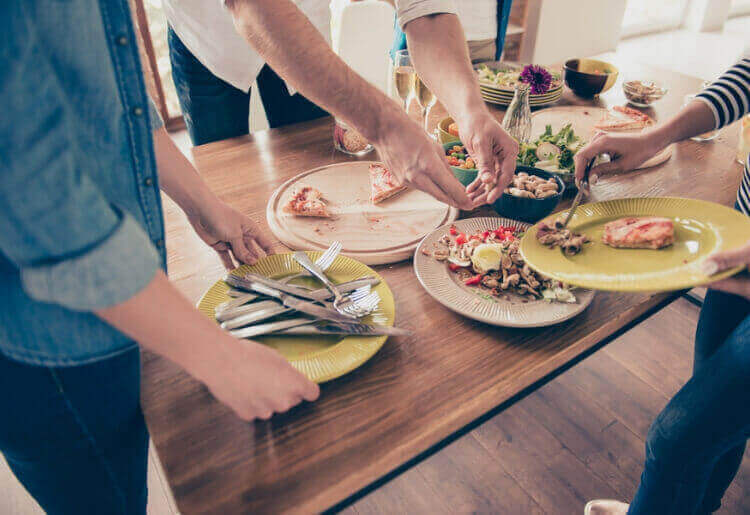 However, at the same time, even with all of the (mostly recyclable) waste produced by meal kits, signing up for a meal kit can help you cut down on food waste. One of the main tips for reducing food waste is to plan out the amount of food you purchase and take home. With meal kits, every week’s food is portioned out precisely, so you don’t have to worry about overdoing it, or buying more than you need. This isn’t just when it comes to the produce in the kits, it's also the sauces and condiments. For instance, let’s say a recipe calls for hoisin sauce. With a meal kit box, you'll have a proportioned container of the exact amount you need for the recipe, so you don’t need to go and purchase a full bottle of something you may only use a handful of times. Another way that meal kits can help is by supporting farmers who are doing things in an Earth-friendly way. Most meal kit companies these days use “sustainability” as a major selling point. And while the majority of meal kit companies have not gone entirely organic, there is a growing emphasis on supporting local, sustainable farmers and producers, which is something we can get behind too. Obviously, each individual person isn’t responsible for stopping the waste of 75 million cows. Nonetheless, cutting down on waste is a lifestyle decision that all of us should be able to adopt without too much work. It’s a matter of being smarter consumers—which can save money too—and also of understanding what you need, what you want, and reaching the understanding that food doesn’t have to look flawless to be nutritious and delicious.